When I was first contacted a few weeks ago by Alex Paman author of Asian Supernatural I was highly intrigued. Aside from being a psychical researcher with a keen interest in all things deemed "supernatural" I also have more recently become an avid fan of Asian horror films. Therefore the title of Alex's book alone was enough to grab my attention. Sadly, until now there has been very little in the way of English resources that are readily available to serious researchers, and enthusiasts alike that adequately covers this vast topic. It was this need that inspired Alex to tackle such an ambitious project and compile his own years of research into one comprehensive new book. It was also for this very reason that I was so excited when the book finally arrived in my mailbox. 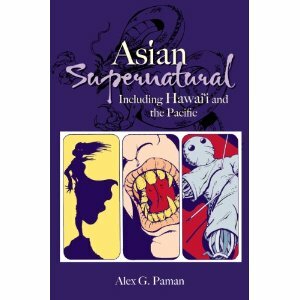 Asian Supernatural including Hawaii and The Pacific covers all sorts of paranormal lore from ghosts and demons to fantastical creatures, and seemingly every other odd character in between. These are listed alphabetically, and categorized by nation, and culture. Did I already mention to you how ambitious the undertaking of a book like this is? I'm certain I did, but I'll mention it again in order to hopefully give you a better appreciation of the magnitude, and scope of such a project. The sheer volume of information to be found within the covers of this book is quite simply impressive. I am fairly familiar with certain Asian lore like the urban legend of the Hong Kong bathroom ghost, which is described as a beautiful female apparition that will change into a frightening faceless spectre after she lures witnesses to a secluded spot. However, soon after I began reading this book I realised how incomplete my knowledge of Asian supernatural characters really was, and how quickly this book was going to become a treasured addition to my own home library. Inside I discovered so many fantastical creatures like the guei, yurei, kwisin, ma, hantu, multo, and lapu that in all honesty I had either limited or no information on before opening this book. The author also has provided his own illustrations of many of the supernatural beings that serve to enhance each unique listing. The comparative capabilities between Eastern, and Western lore provided by such a resource makes it very worthwhile, and useful to researchers. While reading through this book you'll discover that although there are some big differences between the east and west within certain aspects of the supernatural there is also very much that is the same. Rounding out the book quite nicely are several pages devoted to recommended further reading material, and some online investigative organisations that specialise in Asian research. I honestly cannot say enough good things about Asian Supernatural. It is a very handy resource for both psychical researchers, and writers, and has the potential for becoming very well worn as it will be referred to again, and again. I am sincerely looking forward to reading Alex Paman's next book entitled Filipino Ghost Stories due out in early 2011.